IOTransfer - Your Ultimate iPhone/iPad Manager and Video Downloader. Manage and Transfer Photos, Music, Videos, Contacts and other Data. Download videos from 100+ sites, such as YouTube, Facebook, Vimeo, etc. Support a variety of video file formats, including .mp4, .avi, .wmv, .mkv, etc. 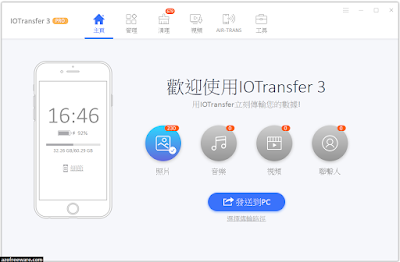 IOTransfer AirTrans allows you to wirelessly transfer music, photos, videos and etc. between iPhone, iPad and computer via WiFi. IOTransfer quickly scan your iPhone or iPad to remove useless files from your device to free up more space and memory.